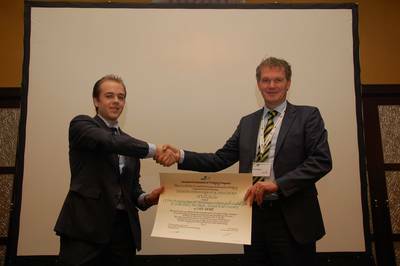 Mr. Verschelde (left) receives the IADC Award for the best paper by a Young Author from IADC’s Secretary General René Kolman. The International Association of Dredging Companies presented its Best Paper Award for a Young Author for the 28th time at the CEDA Dredging Days 12-13 December 2012 in Abu Dhabi, to Mr. Arnaud Verschelde for his paper ‘Erosion Behaviour of a Draghead’. Mr. Arnaud Verschelde graduated from the Delft University of Technology ‘Faculty of 3mE’ (Mechanical, Maritime and Materials Engineering). He is presently a Project Engineer Automation at DEME (Dredging, Environmental and Marine Engineering). The erosion behaviour of a draghead designed in-house at DEME was investigated. The erosion rates created by the flow velocity along the seabed were calculated using potential flow theory. Certain assumptions were made during the use of this theory. These assumptions were validated in a computational fluid dynamics (CFD) model using OpenFOAM. The CFD model also gave a better understanding of the flow field of a draghead during the erosion process. With these theories the productions of the erosion head were calculated and compared to reality. The theory explained in this research can also be used to describe the erosion behaviour of other types of dragheads. The purpose of the award is to stimulate the promotion of new ideas and to encourage the younger men or women working in the dredging industry and related fields. It is presented each year at selected conferences. The IADC grants awards for the best papers written by authors younger than 35 years of age. The winner receives €1,000 and a certificate of recognition. The paper may then be published in Terra et Aqua, IADC’s quarterly journal.